Poulsbo, Washington, Saturday, January 15, 2011 – The Seattle Raging Grannies set the mood for honoring Martin Luther King, Jr’s birthday Saturday at the Ground Zero Center for Nonviolent Action in Poulsbo, Washington. Blockade at Sub Base Bangor/Kitsap. Photo by Leonard Eiger. Eighty three people from the Center participated in a vigil at the Kitsap Mall in Silverdale with the help of a full scale, 44 foot long, inflatable Trident D-5 missile. Each D-5 missile, deployed on Trident nuclear submarines, carries up to 8 warheads, each with an explosive yield of up to 475 kilotons. Each D-5 missile costs approximately $60 million. Back at the Ground Zero Center for Nonviolent Action, Dr. David Hall, former president of Washington Chapter of Physicians for Social Responsibility, presented the threats posed by these nuclear weapons stored at Strategic Weapons Facility-Pacific and deployed on the Trident nuclear submarines based at Bangor Navy Base in Kitsap County. After nonviolence training 12 activists risked arrest by symbolically closing the Trigger Avenue gate during the afternoon shift change as an act of resistance to Trident, a first strike weapons system. Blocking traffic symbolizes stopping the horrific threat of Trident missiles, for a short time. Kitsap County Sheriffs arrested the six protesters. After initial processing they were transported by Sheriff’s van to the Kitsap County Jail for further processing. They were issued citations for blocking traffic and released. Then another six Ground Zero Center activists crossed the ‘blue line’ designating federal control. Patricia “Patti” Bass, 63, of Poulsbo, WA; Carolyn Dorisdotter, 72, Seattle, WA; Norm Keegel, 71, of Bainbridge Island, WA; Gordon Sturrock, 52, of Eugene, WA; Sam Tower, 68, of Tacoma, WA; and Robert Friend Weber Whitlock, 32, of Olympia were arrested by naval security personnel, processed and released after being issued citations for trespassing. Relating to the day’s theme of “Billions for Life, Not Billions for Death, according to Western Washington Fellowship of Reconciliation, “Washington State is planning to cut schools, health care, public safety and other programs by more that $4 billion. While Washington State taxpayers have paid $28.6 billion so far for the wars in Iraq and Afghanistan.” That figure does not include the annual defense budget or nuclear weapons spending. The Trident submarine base at Bangor, just 20 miles from Seattle, is home to the largest single stockpile of nuclear warheads in the U.S. arsenal, housing as many as 2000 nuclear warheads. In November 2006, the Natural Resources Defense Council declared that the 2,364 nuclear warheads at Bangor are approximately 24 percent of the entire U.S. arsenal. The Bangor base houses more nuclear warheads than China, France, Israel, India, North Korea and Pakistan combined. 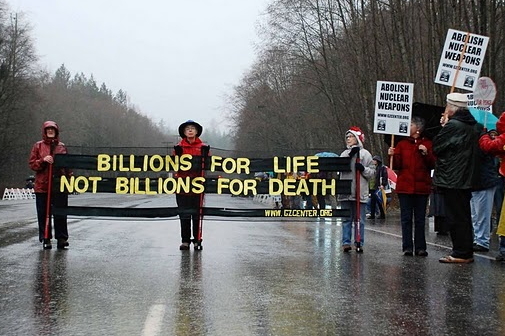 For over thirty-three years Ground Zero Center for Nonviolent Action has engaged in education, training in nonviolence, community building, resistance against Trident and action toward a world without nuclear weapons.